Rendezvous with Rama starts when an large, cylindrical object is detected hurtling towards the sun. The object is named “Rama” after the Hindu god. The United Planets sends the solar survey vessel Endeavour under the command of Commander Bill Norton to investigate. The rest of the book focuses on the crew’s exploration of the alien artifact.Rama is excellent at evoking a sense of wonder. Clarke manages to convey the artifact’s grandeur and to create a uniquely bizarre alien world. The structures and other things encountered do not resemble the familiar sci-fi tropes. I especially liked how Clarke takes advantage of Rama’s artificial gravity (generated by the object’s spin) to present the astronauts with a new challenge. Even more than the alien structures, I’ll always remember the description of Commander Norton climbing “down” the ladder towards Rama’s “ground. That said, Clarke demonstrates an admirable amount of discipline in not revealing everything about Rama. Some mysteries remain unanswered, and are thus all the more intriguing. I can only imagine that, when the book was first published in 1973, the effect was even greater and there were fewer books about alien worlds. I haven’t read the sequels, but fear they would undermine the majesty of this book. Clarke has always focused more on alien life and technology than on characters in his stories. That said, the characters in Rama are surprisingly serviceable, if not great. Commander Norton gets enough backstory to make him relatable. Norton’s interest in and admiration for James Cook, captain of an earlier Endeavour, gave him some depth. For those who know their history, it also infused the story with some foreshadowing over Norton’s fate. I’ve criticized Clarke’s problems ending some of his stories in a satisfactory manner, especially his tendency to rely upon incongruous twists or cheats to resolve plot threads (see, for example, my review of Clarke’s Childhood’s End). Fortunately, Rama avoids this problem. The story ends in a manner that suits the mystery and grandeur of Rama. There is a twist at the end, but it manages to be both subtle and thought-provoking at the same time. I could see how readers demanded a sequel, but the book was designed to – and mostly manages to – stand on its own. Most of the crew members at least get a few personality quirks that help distinguish them, although few are actually memorable. The lack of characterization generally works – until it doesn’t. At a few points, the book places some of these characters in danger and the reader is expected to care, but I found it hard to do so. For example, two-thirds into the book, a character whom we’d never seen before, Jimmy, suddenly appears, and then the next 15% of the book focuses on him and his trials. At the least the character would have benefitted from some sort of introduction. 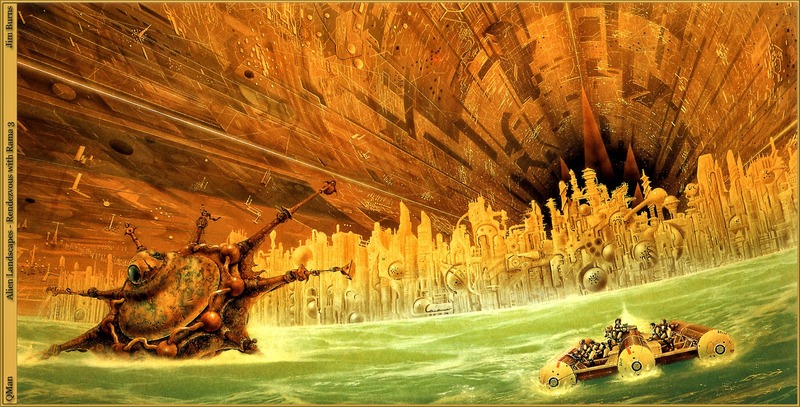 Rendezvous for Rama isn’t for anybody. This book is about exploration writ large, about drive to explore rather than the discoveries. If you want a fully realized alien civilization, this isn’t the book for you. However, if you want a somewhat realistic account of how man’s first contact with alien technology might occur, Rama is still a classic.